Experience the 18th century in the glow of flickering candles for a very unique DaPonte String Quartet concert. 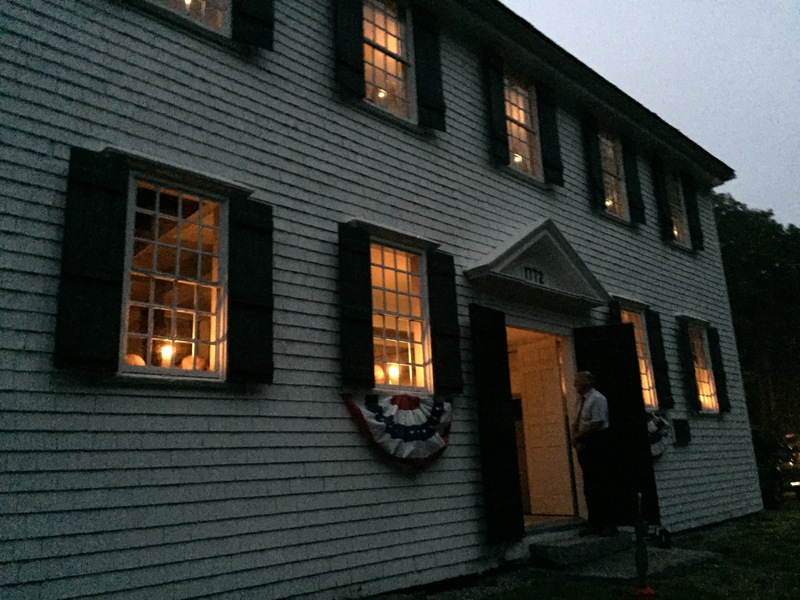 The concert will be held at the all-original, pre-revolutionary, Old Walpole Meetinghouse on Sunday September 9, 2017 at 7:00pm (doors open at 6:30pm). Tickets are $25 and are available only by pre-purchase, not at the door. Tickets for this very special event may be purchased on-line by credit card at https://www.brownpapertickets.com/event/3556974 or by check/cash at Sherman’s Maine Coast Bookstore in Damariscotta, the Walpole Barn in Walpole (Rt. 129), or the Boothbay Harbor Framer’s Gallery in Boothbay Harbor (Meadow Mall).To make other arrangements for tickets, please call 882-7744 or e-mail info@oldwalpolemeetinghouse.org. Note also, that because this is a special fund-raising concert to benefit replacing the roof shingles on the Meetinghouse, we are not able to honor tickets for other Daponte venues in the “Leaf Peeper Series”. The DaPonte String Quartet is comprised of Lydia Forbes and Ferdinand (Dino) Liva on violin, Kirsten Monke on viola, and Myles Jordan on cello. The special performance this year celebrates works by Franz Josef Haydn (1732-1809), Alfred Pochon (1878-1959), and Franz Schubert (1797-1828). The Quartet has performed at Carnegie Hall, has been featured on CBS Sunday Morning, and toured in France, Scotland, and Canada, as well as in over twenty American states. They have broadcast on nation-wide radio and television both in the United States and Canada, received awards from the NEA, Philadelphia Musical Fund Society, Music Teachers National Association, Chamber Music America, and Maine Arts Commission. They have also recorded three CD’s, with a fourth coming soon. Please bring a cushion for comfort and flashlights to guide you to your vehicles after the event. 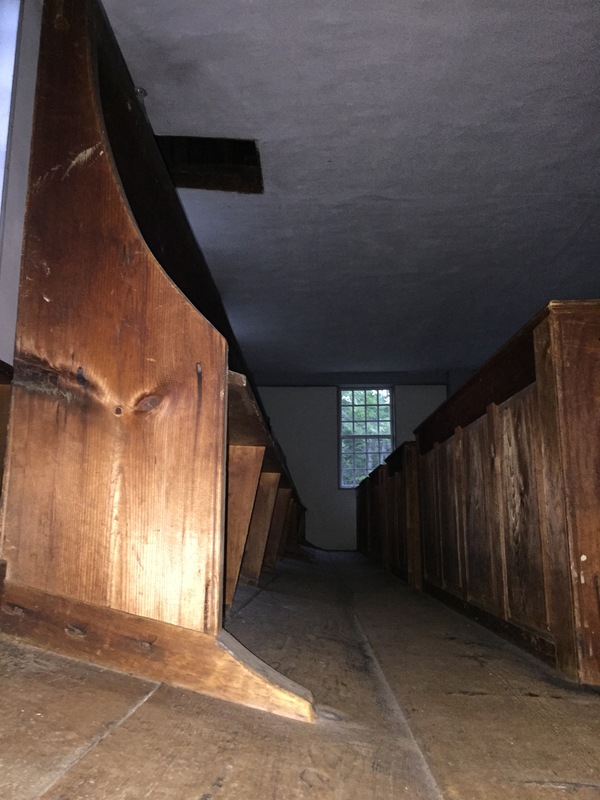 Tax-deductible contributions toward the roof replacement project would be gratefully accepted and should be sent to Old Walpole Meetinghouse, P.O. 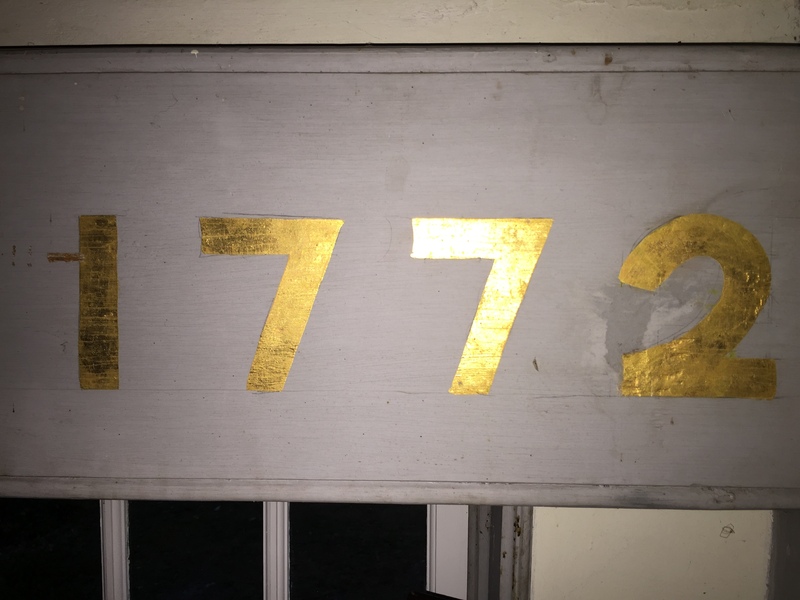 Box 47, Walpole, Me 04573. 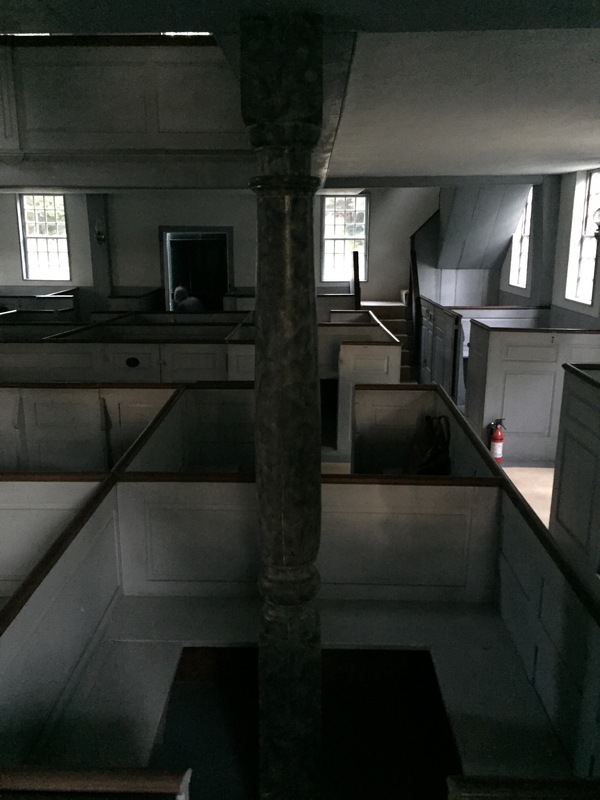 Old Walpole Meetinghouse is a non-profit 501c(3) historical and educational organization. 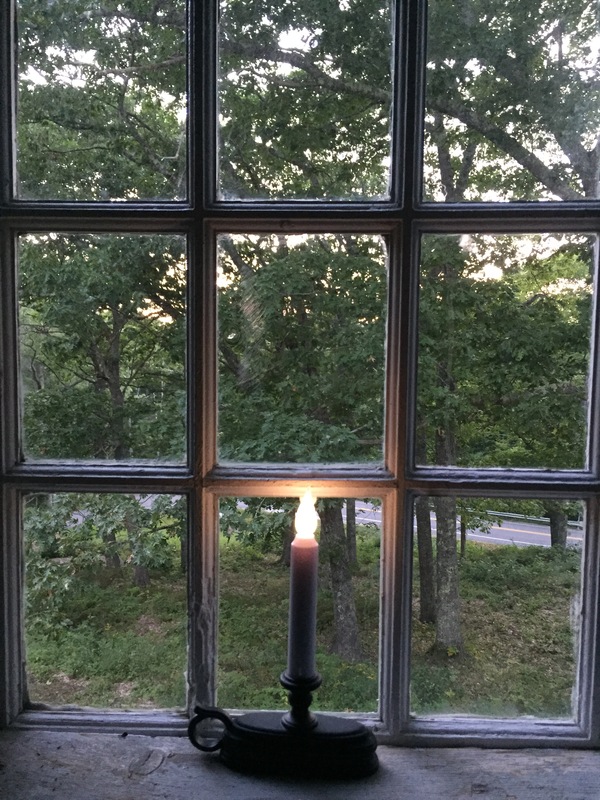 Experience the 18th century in the glow of flickering candles for a very unique DaPonte String Quartet concert. 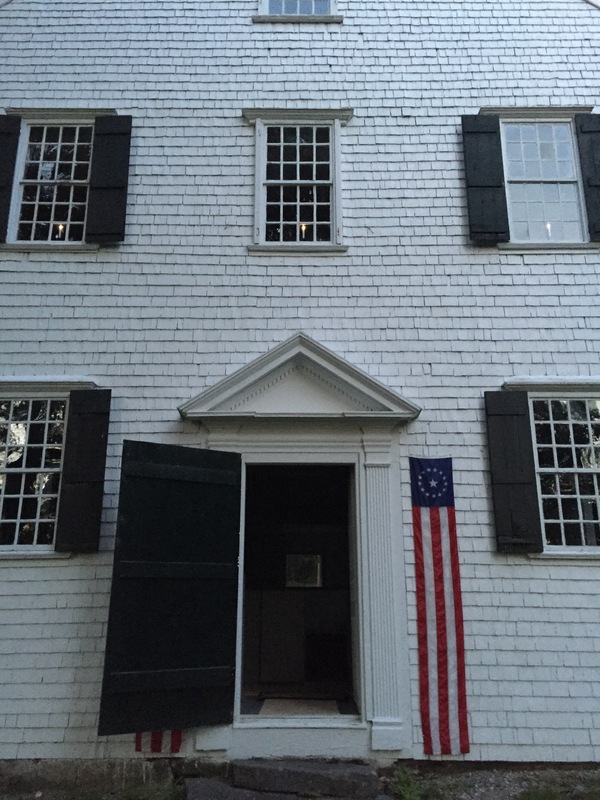 The concert will be held at the all-original, pre-revolutionary, Old Walpole Meetinghouse on Sunday September 11, 2016 at 7:00pm (doors open at 6:30pm). Tickets are $25 and are available only by pre-purchase. Ticket outlets are (by cedit card) through Brown Paper Tickets: (http://www.brownpapertickets.com/event/2569800), or (by check) at the Maine Coast Bookstore in Damariscotta, the Walpole Barn in Walpole (Rt. 129), or the Framers Gallery in Boothbay (Meadow Mall). 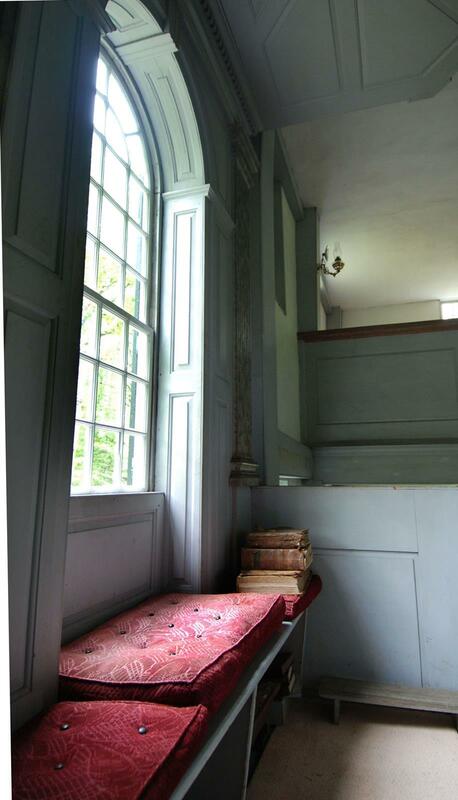 To make other arrangements for tickets, please call 563-5471 or e-mail info@oldwalpolemeetinghouse.org. 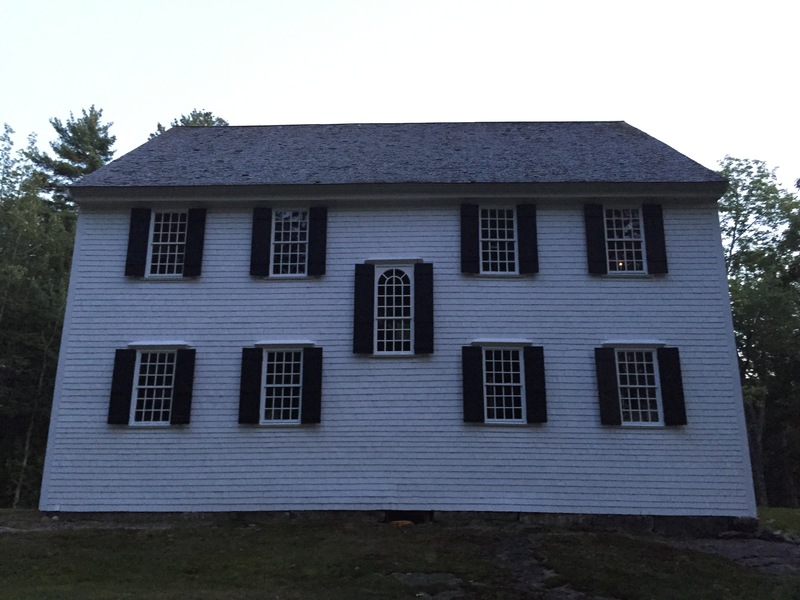 The Meetinghouse is located 3.5 miles south of Damariscotta off Route 129 at 4 Meetinghouse Road in South Bristol. The DaPonte String Quartet is comprised of Lydia Forbes and Ferdinand Liva on violin, Kirsten Monke on viola, and Myles Jordan on cello. The Quartet has performed at Carnegie Hall, been featured on CBS Sunday Morning, and toured in France, Scotland, and Canada, as well as in over twenty American states. They have broadcast on nation-wide radio and television both in the United States and Canada, received awards from the NEA, Philadelphia Musical Fund Society, Music Teachers National Association, Chamber Music America, and Maine Arts Commission. They have also recorded three CDs, with a fourth coming next fall on Centaur Records. 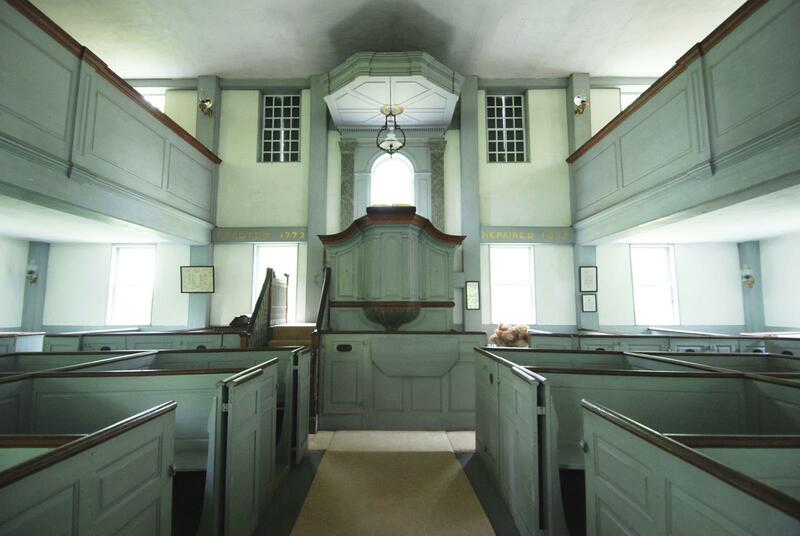 The Meetinghouse is on the National Register of Historic Places and is an exquisite example of colonial architecture, which includes a soaring hand-carved pulpit. The proceeds from this concert benefit the maintenance of the structure. 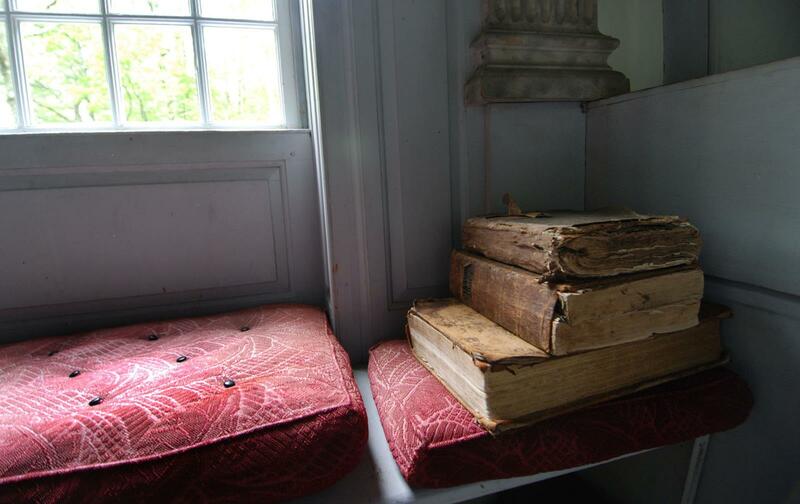 In particular, the original 12 over 12 light windows are in need of restoration. We covenant with the Lord and with one another, and so bind ourselves in the presence of God, to walk together in all his ways according as he is pleased to reveal himself unto us in his blessed word of truth. Puritans functioned as the established church, and maintained until the late seventeenth century the fiction that they were Puritan members of the Church of England and had not separated from the Church of England. In actual fact, each church in Massachusetts functioned largely independently; when ministerial associations were formed, they were given only limited advisory capacity. Unlike the French to the North and the original residents of the Pemaquid Peninsula, the Puritans generally made few attempts to understand Native Americans and often dealt treacherously with them. Unlike the French, they also, with some honorable exceptions, made little attempt to evangelize the Native Americans. The consequences of this would be dire for settlers of the peninsula later on in the seventeenth and eighteenth centuries, during the French and Indian wars. Initially, it was only church members who could vote in civil elections. The Massachusetts Bay Company, formed as a trading company, cleverly converted itself into a colonial government by taking its charter with it when its members emigrated to America and meeting, not in England, but in New England. The result was not what we think of as religious liberty at all! Settlers who deviated from Puritan doctrine were expelled from the colony, as Roger Williams was, or even hanged, as were Mary Dyer and other Quakers. As a consequence of the treatment of Mary Dyer, King Charles I explicitly forbade Massachusetts from hanging Quakers. Of course, not everyone who came to the area was a Puritan. The original settler of Quincy, Thomas Morton, was a liberal Anglican who established a prosperous and fast-growing colony there, especially profiting from fur trade with the Native Americans, with whom he established much better relations than the Puritans did. He was tried by the Puritans on trumped-up charges, put in stocks, and exiled to Isle of Shoals until he could be sent back to England. Hounded out of Massachusetts by the Puritans, he put his case before the authorities in England, and as a result the charter of the Massachusetts Bay Company was revoked. However, before this action could be put into effect, the English Civil War had broken out, Puritans were in control, and when he returned to Massachusetts, he was tried for sedition as a royalist. Released because of his ill health, he spent his last days with royalist protectors in the West country of Maine. But after their support of the revolutionaries in the English Civil War, when the monarchy and the Church of England were restored it was impossible for the Puritans of Massachusetts to maintain the fiction that they were a legitimate part of the Church of England and to suppress other religious bodies. Anglicans were reluctantly allowed to open parishes in Massachusetts –– Old North Church, where the lantern was hung for Paul Revere, was an Anglican parish founded by Timothy Cutler, the rector of Yale University who was fired when he became a convert to Anglicanism. I have spoken primarily about Puritans in Massachusetts. What about Maine? Before the Pilgrims settled at Plymouth, Pemaquid and surrounding islands were settled, at first temporarily, by those who were seeking not God but cod. Most of the earlier English in this area were here while they caught and dried fish. A little later a prosperous trading post was established here dealing in the fur trade. It is unlikely that any of those involved were Puritans; they came from the West Country, where Puritanism never had a stronghold. Eventually a few settlers established farms in the area, on land supposedly deeded to them by the Native American sachem Samoset in 1625, although there is a suspicion that the deed was forged. Settlement continued through much of the seventeenth century, until attacks by Native Americans drove most settlers from the area. Settlers came in a variety of waves thereafter. A series of forts were built on the present site of Colonial Pemaquid to protect settlers –– in many cases, not very successfully, since the forts fell twice to the French and Native Americans. Religious services were probably provided sporadically in the fort by chaplains and visiting ministers, Puritan and Anglican. Occasional services were provided about the time of the town’s incorporation by travelling ministers. Their ancestors had fought fiercely in the border wars between England and Scotland and later as colonists in Ireland had to defend themselves against the resentful native Irish, so they were well known as fierce fighters. Some of them had come as early as 1640. Many of them were settled by Colonel David Dunbar in this area between 1729 and 1734. That brings us to the time that this meeting house was erected. The Massachusetts legislature, the Court of Common Council, insisted that every town provide for the preaching of the gospel. It took Bristol a while to comply after it was incorporated. After several acrimonious town meetings, the town was divided into three parishes and meeting houses were erected at Harrington, Walpole, and Broad Cove or Bremen in 1772. 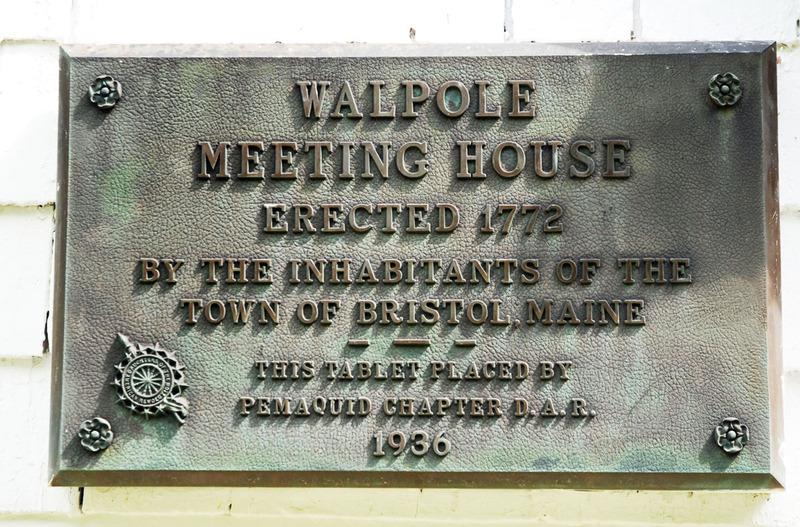 The Harrington and Walpole meeting houses still survive, though neither holds regular services. So once again it’s no surprise that Bristol residents did not initially choose to associate with the Standing Order of the Congregational Church. Let us continue our discussion of worship. While the Bay Psalm Book, the first hymnal of the Puritans, acquired fame as the first book printed in New England, it certainly has never won any literary prizes. In fact, its doggerel is so bad that not even one of its psalms remains in current use! 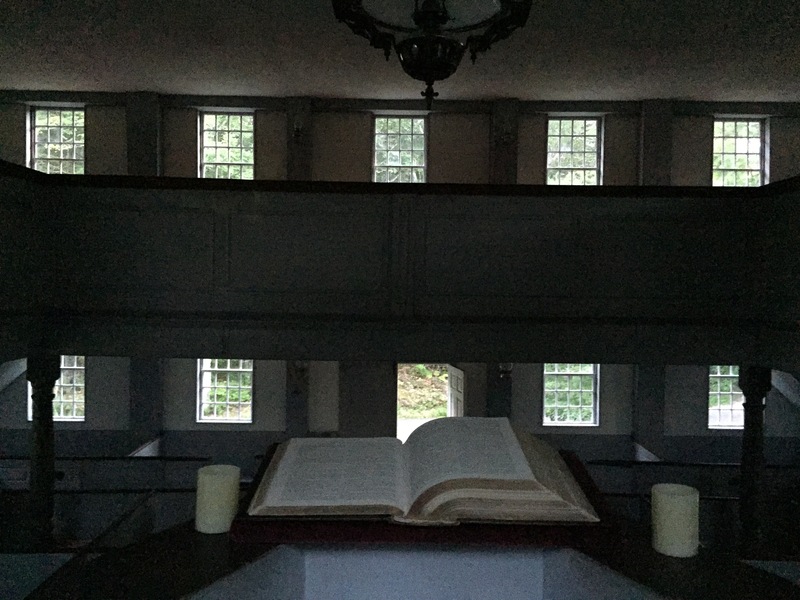 In the early eighteenth century more satisfactory metrical psalms and other hymns were produced by the English Congregationalist Isaac Watts and others, and no doubt those were in use in America by the time the Walpole Meeting House was erected. But hymn singing in those days might strike us as cacophony. 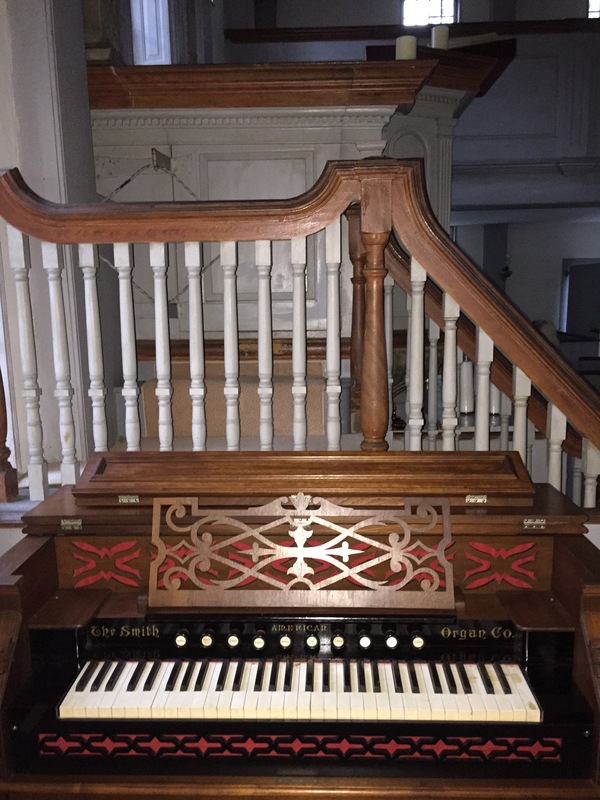 New England churches originally had neither the organs nor the parish bands that were used by Anglican churches, not all church members had hymnals, and hymnals seldom included tunes, so the parish clerk would sing hymns out line by line, and the congregation would repeat the lines after him. Eventually singing schools were established, to teach parishioners to sing hymns without having them lined out – what was called regular singing. The most famous teacher of the travelling singing schools was William Billings of Boston. Communion was probably celebrated quarterly, the Scottish practice. Puritans initially observed it monthly. Only those who were qualified as communicant members by the elders of the church would be admitted. In Scotland, it was customary to give out communion tokens to communicant members to present for admission to the communion table. However, we might suspect that members in Bristol were admitted on profession of faith and evidence of good conduct, and that the older Puritan standard of satisfactory public testimony of an internal experience of God’s effectual call was not enforced. Puritans and Scottish Presbyterians also rejected Christian feasts and seasons, observing neither Christmas nor Easter, but only the so-called Sabbath and periodically appointed days of fasting. Of course, if they were really biblical, they would reckon Saturday as the Sabbath and not Sunday, which is properly called the Lord’s Day. Given the Scots Presbyterian background of the majority of the settlers, it is also not surprising that when the townspeople finally got around to calling a settled minister, the first one that they called was a Scotsman who had been educated at Edinburgh, the Reverend Alexander MacLean. He seems to have been of a haughty disposition and was not particularly popular. The most notorious incident in his life came when his wife, the daughter of the wealthiest man in the Bristol, sent her slave girl out to look for lost cattle on a snowy night and told her not to come back until she had found them. The girl perished in the night. Mr. MacLean served the three parishes in a circuit, preaching in two of them each Sunday. 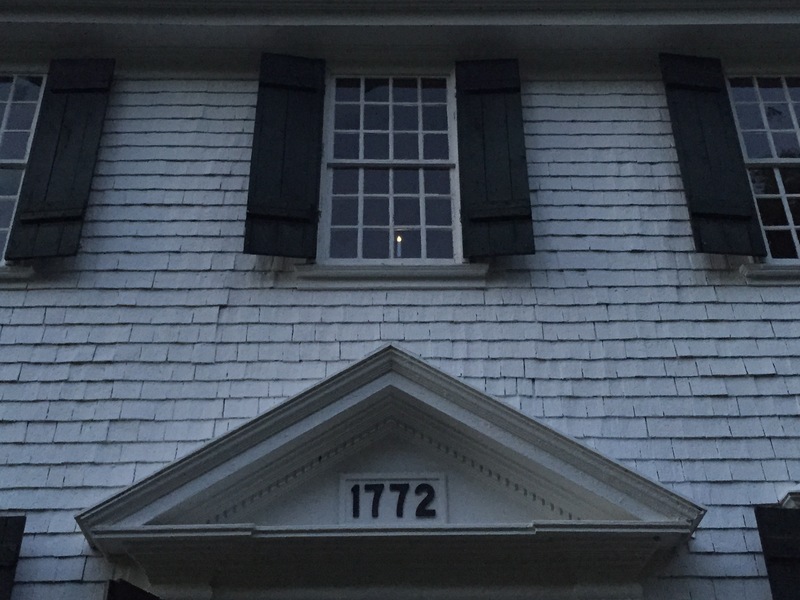 He served from 1772 to 1798. There weren’t many Presbyterians in the Bay Colony at the time, and the presbytery was centered far away in Boston. So after a few years the churches in Bristol affiliated with what we now know as the Congregational Church, with local headquarters in Portland. The end of the eighteenth century saw considerable change in the religious scene in the area. It was the time of a religious revival, and Methodists and various Calvinist and free-will Baptists were active in the area. Bristol was part of a Methodist circuit, and in the next century several Methodist churches would be erected in Bristol. A Baptist Church, established in 1819, dominates the landscape at center of Damariscotta. Roman Catholic emigrants from Ireland who settled in Newcastle were ministered to by travelling Catholic priests in the last years of the eighteenth century and built what is now the oldest standing Roman Catholic church in New England in 1808. 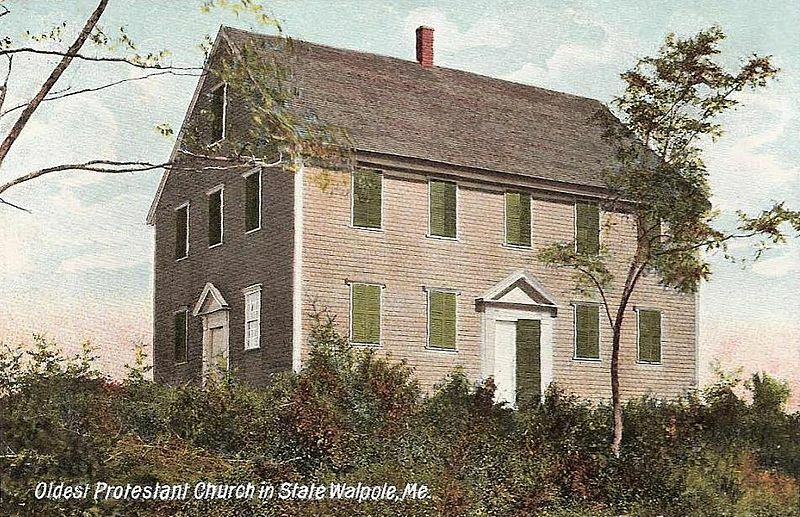 Because of the relative independence of Congregational parishes, the simplicity of church covenants, ample enough to be open to a wide variety of interpretations, and the lack of a fixed liturgy to maintain a doctrinal standard, Congregational churches in Massachusetts, influenced by the rationalism of the period, were moving toward Unitarianism or Universalism, unlike their brethren in Connecticut, who were more tightly organized under the Saybrook Platform and maintained Puritan orthodoxy. The Brattle Street Church in Boston was founded in 1699 to uphold “broad and catholick” Christianity, which rejected the Calvinism of the earlier Puritans and no longer distinguished classes of church membership and would in the next century reject the revivalism of John Edwards. By 1800 most Congregational Churches in Boston were in fact Unitarian, and Harvard University became Unitarian in its outlook in the course of the century. In the end, three quarters of the first one hundred Massachusetts parishes left the orthodox Puritan fold. 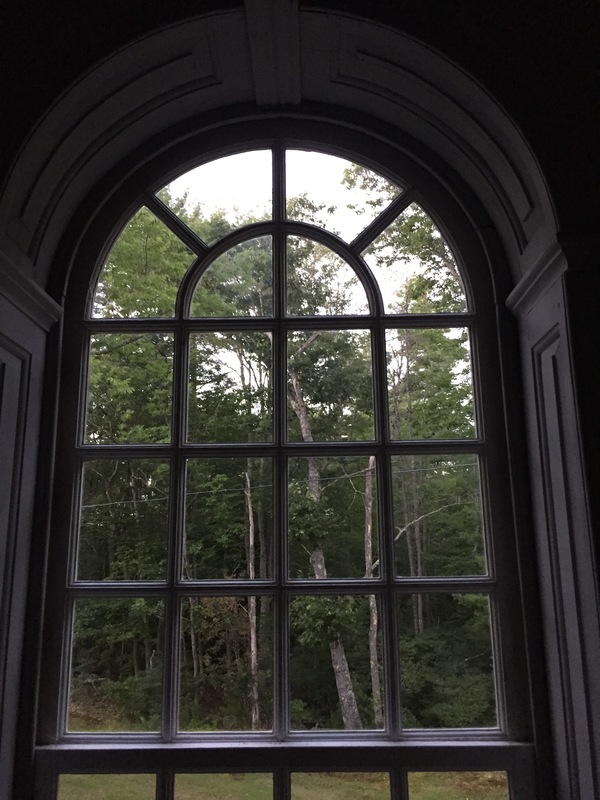 Maine churches felt the same pull, and the Harrington Church would affiliate with Universalists by the middle of the nineteenth century. The nineteenth century also marked the end of an era for established churches supported by town taxes in Maine. Quakers and others protested paying a church tax, and one year a Methodist minister successfully sued the town for support. In 1820 the church tax was abolished in the new state of Maine. With such a mixed population, it is not surprising that only two Congregational churches, now part of the United Church of Christ, remain in the area, located in Bristol Mills, where the center of the town of Bristol has shifted, and in what is now the town of South Bristol, that Bremen now has a Union Church, and that the Brown Church in Round Pond is non-denominational. The peninsula where men first came seeking cod rather than God is now home to Christians of many denominations, and to those who affiliate with no denomination. (ii) William Bartlet, The Frontier Missionary: A Memoir of the Life of the Rev. Jacob Bailey (New York: Stafford and Swords, 1853), on line at The Frontier Missionary: A Memoir of the Life of the Rev. Jacob Bailey, available on line at http://books.google.com/books/about/The_Frontier_Missionary.html?id=f1PBLnVm3nsC, pages 88-89. 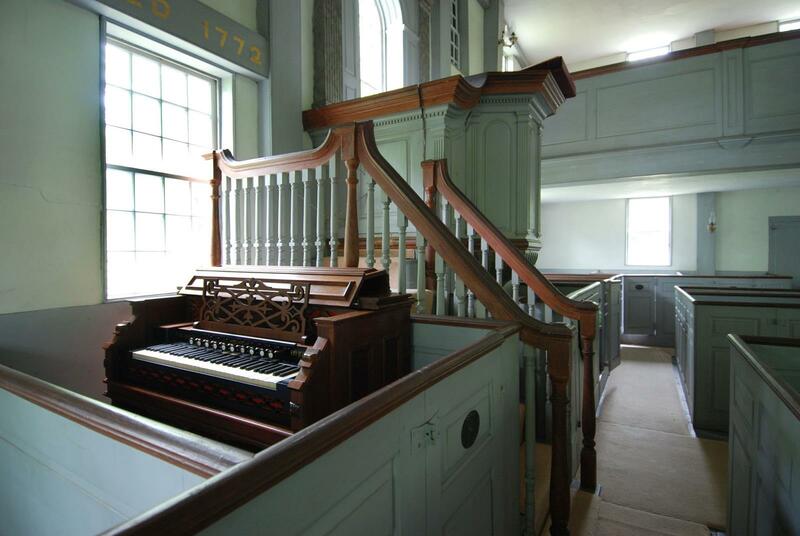 The concert will be held at the all-original, pre-revolutionary, Old Walpole Meetinghouse on Sunday September 7, 2014 at 7:00pm (doors open at 6:30pm). The DaPonte String Quartet’s special performance this year celebrates the Sounds of Autumn with works from Franz Josef Haydn (1732-1809) Béla Bartók (1881-1945), and Felix Mendelssohn (1809-1847). 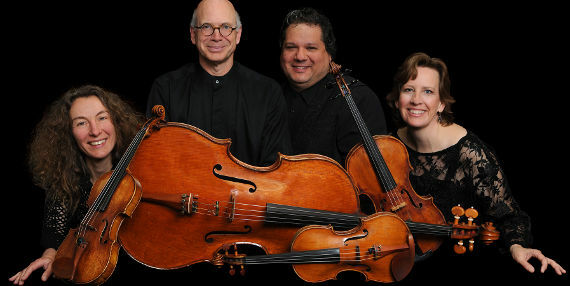 The DaPonte String Quartet has received awards from the National Endowment for the Arts, the Philadelphia Musical Fund, the Music Teachers National Association Chamber Music America, and they were recently voted “Best Music Group in Maine” by the readers of Down East Magazine.